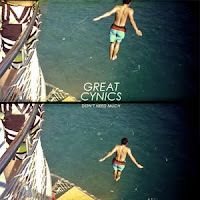 Despite a name change (from Cynics) and the transformation from a solo act to a trio, Great Cynics' debut full-length is the perfect follow up to last year's 'Stones I've Thrown'. Ten songs of honest and laid back punk rock made for lazy summer days. Throughout Giles Bidder shows a sense of realism; on 'Nightcaps' he sings "open my eyes without a reason, I just get up because it's sunny outside" whilst the rest of the band provide a bright, loose and upbeat style that bounces along at a good pace. Bidder's songwriting has improved and is easy to relate to; insecurity about girls - "easier to stay on Friday nights because the girls never looked at me", falling in love (see 'Twenty Five') and generally being young, drinking, lazy days, gigs and growing up. Musically the band are easily comparable to bands like The Gaslight Anthem and Against Me! and singers like Billy Bragg and Frank Turner, yet the combination of Bidder's thoughtful lyrics and the band's bright sound brings about a bittersweet feeling that leaves you hooked. The addition of Bob Barrett on drums and Iona Cairns (on bass) are worthy additions and hold up Bidder's words with a fun texture. Coming in at 24 minutes, 'Don't Need Much' proves to be a record that can be easily taken in and concludes to be an addictive record; that sensibly fuses folk and punk rock together and creates an uplifting and honest sound that helplessly wins you over. A worthy record to become this summers soundtrack. 'Don't Need Much' by Great Cynics is available now Household Name/Kind Of Like. Purchase 'Don't Need Much' through Banquet Records. Great Cynics on Facebook, MySpace, Twitter and Tumblr.